My Trips Mobile is a great way to keep track of your travels and make adjustments while you are on the road. You can even dictate your interaction notes in app and we'll convert your speech to text for quick entry! Keep reading for all of the functions of My Trips mobile on iOS. 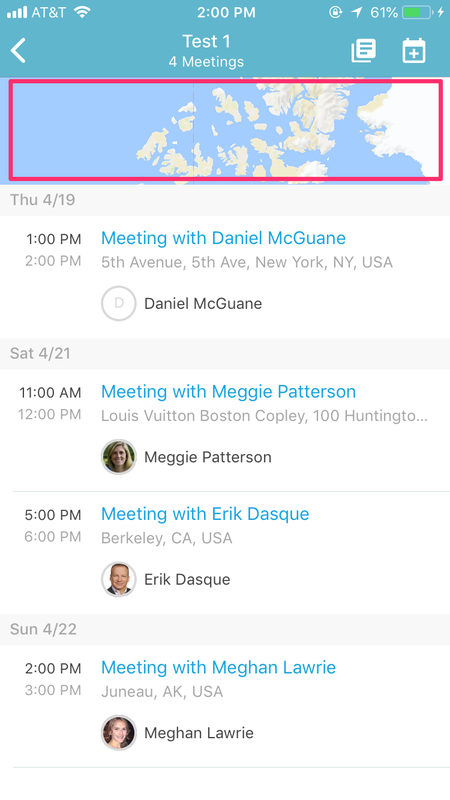 You can also check out this article if you want to learn how to easily find filler meetings and add constituents to your trip from the map view. See all of your Trips and view other's Trips - View any trip where you are the creator (owner) or are listed as a collaborator. 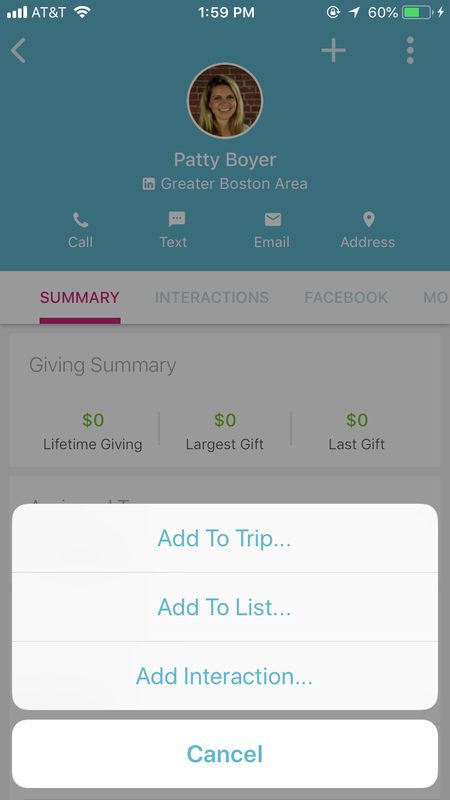 To see your trips, open the menu at the top left of your EverTrue advancement app and click on My Trips. Create a new Trip - Click the plus sign in My Trips to add a new trip. You will be prompted to enter a few details about your trip - make sure to scroll through the entire list of fields, both required and optional. Click save at the top right to create your Trip! Create Meetings - To create a meeting, go into your trip and click the Calendar icon in the top right. Choose either meeting (interactions with constituents) or time block (non-meeting scheduled time, such as flights or transit time). View Your Trip Log - Your trip log will be the first component you see when you select a trip. It will show your meetings in chronological order. Delete a Trip - To delete a trip, click the ellipses icon on the main My Trips home screen and click Delete. Add, Edit, and Delete Interactions - To add, edit or delete an interaction, click on the constituents record. On the record, click on the three-dot icon at the top right. You will then have the option to add an interaction. To edit or delete an interaction, go to the interactions tab and select the interaction you would like to edit or delete. Dictate Interactions - When entering an interaction, click the microphone button on your keyboard (to the left of the space bar), which will allow you to dictate your interaction. View Trip on a Map - On the main trip screen, select the map above the listed meetings. This will open the full map view of your trip. 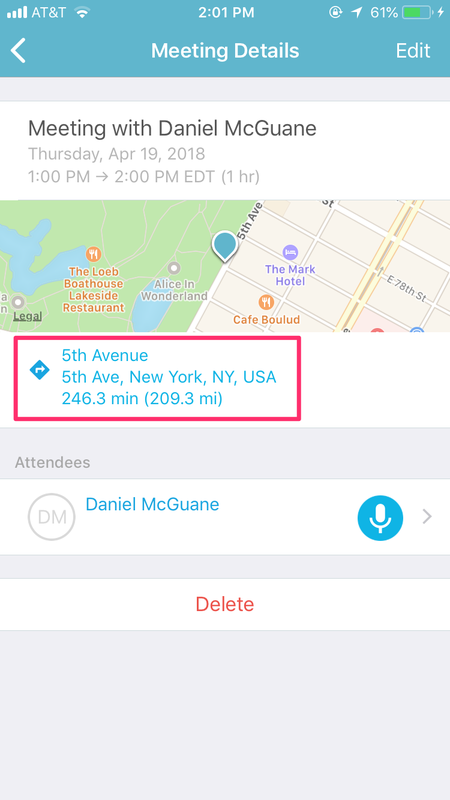 Get Directions - You can get directions to any meeting by opening that meeting, then clicking on the blue address listing.